What time does the canteen open? How do I tell the school my child is sick today? What are school hours? All the itty bitty practical details to help you navigate primary school with a smile. Have we missed something important? Let us know. School starts: 8:45am - we recommend arriving by 8:30am to settle before the bell. Parents of primary children can order lunch for students using online ordering system directly from the online canteen. Click here for the Online Lunch Orders portal. Click here for the Primary canteen menu. The wheels on the bus go round and round, click here for bus information. We meet with parents in parent conferences twice a year. On both occasions we encourage children to participate in the meetings as they are core participants in the learning. We also report twice a year in writing. Firstly, at the end of Term 2 and again at the end of Term 4. Join us to support your children in their primary school assembly. The whole primary school meets together on a Friday morning at 9am in the Primary Hall. Different classes share and celebrate their learning experiences at assemblies and they’d love to welcome parents too. Where is the main office? 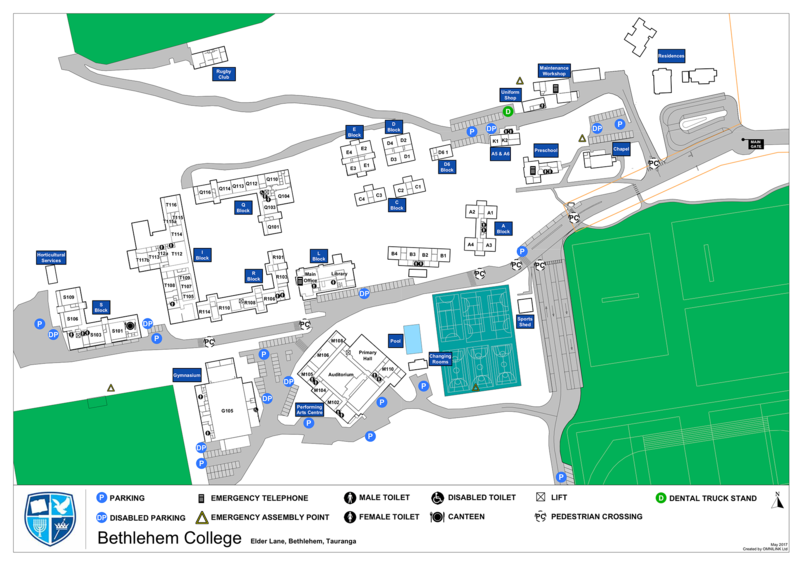 Here’s a map of Bethlehem College so you can get around easily. Download the map. If your child is not going to be at school, please either email absences@beth.school.nz or ring and leave a message with the school office (07) 576 6769. A roll check is completed in classes before 9am. If your child is absent and we haven’t heard from you, we will contact you to ensure your child is safe. The Bethlehem College Library and Resources Centre is open every school day, from 7:30 to 4:00. Parents are asked to name all children’s clothing and property and to encourage children to be accountable for their belongings. Lost property is located in the lost property cupboard outside B Block. At the end of each term unclaimed clothing is donated or recycled. Families are asked to sign a permission slip allowing children to participate in all school trips that happen during the year. Parents will be notified of events as they come up, but permission will be assumed.